Dear God, I finally found it! Literally after washing my hair ONCE with Living Proof Frizz Shampoo and Living Proof Restoring Mask Treatment my hair was so incredibly smooth! I have wavy/curly, shoulder-length, layered hair that has always felt like it was not smooth. You know when no matter how soft or styled your hair looks but then you run your fingers through it and are just disappointed by the texture and layers? Yeah, well that’s my hair. Everyday. So I have tried practically everything from no frizz sprays to insane moisture restoration shampoo and conditioner combinations with minor to temporary improvements. Finally, after an hour of research on the differences between Moroccan and Macadamia oil, I decided that I would head over to my trusty Ulta store for some in-person advice. Immediately when I told the woman my problem she directed me to Living Proof, amongst other less appealing options. Turns out that Jennifer Aniston (who can resist Jen, am I right?!) is the co-owner of the company and that Allure Magazine voted the frizz-fighting duo for the best shampoo and conditioner of 2014. To make the whole thing 10 times better, the old-as-time sales pitch turned out to be true; I really saw results after one use! Plus, I was outside in the rain and humidity all day without an umbrella (super smooth Marin) and my hair held up! 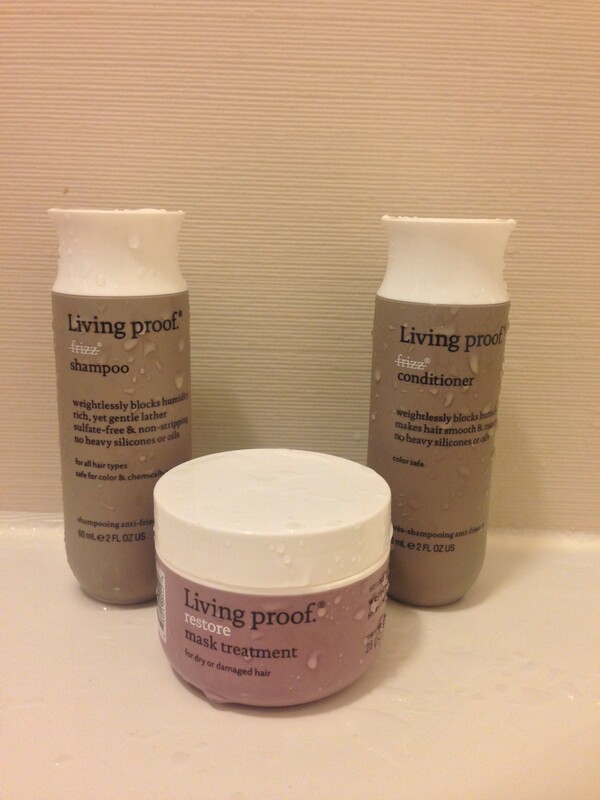 I bought the travel/sample size in the shampoo and conditioner, but believe me I am definitely getting more! I will also keep you updated on future uses as well as write a post on my hair care routine, so stay tuned! I will also post photos of my second-day hair after washing with these products so you can check them out!